Are you experiencing pain and/or tenderness in your neck, shoulder, arm and hand? Are you also experiencing numbness and tingling in these same regions as well? If this is your situation, then you may be experiencing a condition called thoracic outlet syndrome. This condition involves abnormal pressure to a nerve or blood vessel which can contribute to the above symptoms. Physical therapy is often utilized to help treat for thoracic outlet syndrome. Thoracic outlet syndrome is usually the result of pressure on the nerves in 95% of the cases with the remaining percentage of cases affecting the artery or vein (2). Some of the causes of TOS can be attributed to: trauma ie. whiplash from a motor vehicle accident, repetitive activities ie. job duties (assembly line, typing), playing musical instruments, participation in sports, poor posture ie. forward head, forward shoulders, static posture, anatomical abnormalities ie. extra rib, abnormal positioning of scalenes muscles, pectoralis minor tightness, tight congenital fibromuscular band which connects the spine to the rib, or entrapment at the costoclavicular space (space between the first rib and collarbone) ie. back pack or purse over shoulder, carrying heavy objects. Symptoms can vary depending on which structures are being affected and compressed. Pressure on the nerves can result in: numbness and/or tingling at the palm, forearm, neck and shoulder; atrophy or wasting of the muscles of the hand; pain in the neck, shoulder, arm and hand; and cramps in the forearm. In contrast, pressure on the blood vessels can result in: sensation of heaviness in the arm and hand; swelling or edema in the arm or hand; easy fatigability of the arm and hand and a sensation of coolness in the arm and hand. Thoracic Outlet Syndrome Treatment Options for a P.T. 1. Telford E, Mottershead S. Pressure at the Cervico-Brachio Junction - An Operative and Anatomical Study. The Journal of Bone and Joint Surgery 1948; 30 B, No. 2:249-265. 2. Sanders, R.J., Haug, C.E. (1991). 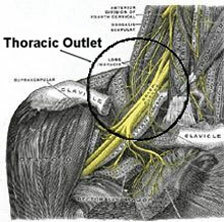 Thoracic Outlet Syndrome - A Common Sequela of Neck Injuries. Philadelphia, PA: Lippincott.